New Right chief Naftali Bennett says his party will ensure next Likud government takes a hawkish stance on territory and terrorist releases. Education Minister Naftali Bennett (New Right) blasted the ruling Likud party Tuesday night, accusing the Likud of permitting the judiciary to seize control of the functions of the Israeli government. Bennett, who broke away from the Jewish Home party he headed until last December to form the New Right, called his faction the “real right-wing of Israel”, touting its hawkish positions on territorial issues, the release of terrorists, and its advocacy for judicial reform. 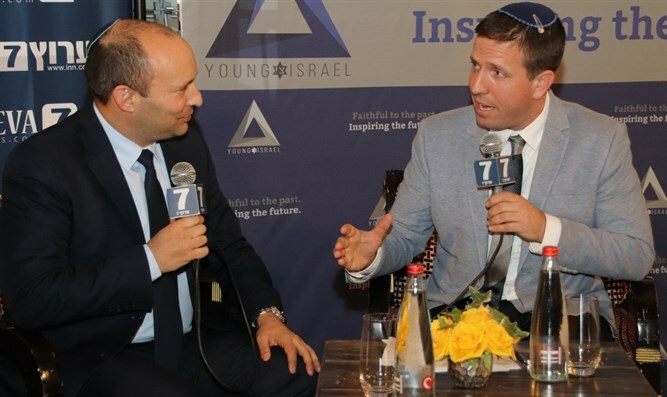 Speaking at the joint Arutz Sheva – National Council of Young Israel pre-election conference Tuesday night, Bennett alluded to Justice Minister Ayelet Shaked’s (New Right) efforts over the last term to curtail the Supreme Court’s use of judicial review and to restore the balance between the branches of government. Bennett also ripped the Likud over its 1997 Hebron Protocol Agreement, surrendering most of the city to the Palestinian Authority, and the 2005 Gaza Disengagement plan. Turning to Israel Resilience chairman and former IDF Chief of Staff Benny Gantz, Bennett chided Gantz’s attempts to portray himself – and his party – as centrist.